This weekend was absolutely bitter cold with howling winds of 40 mph. We planted two little apple trees and nearly froze to death! 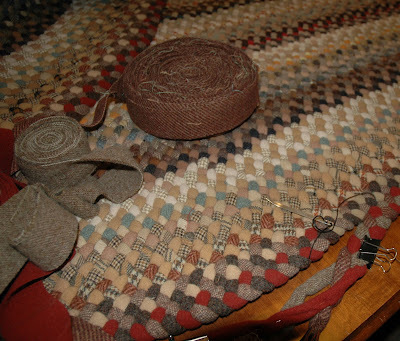 It was a good weekend to stay inside and work on the rug. Several days ago I finished up row 55. I just now finished up row 56. I cannot believe there is only one more row to go! 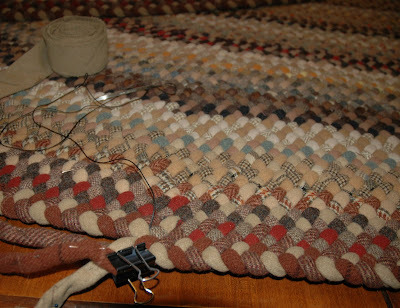 What was my life like before I was working on this rug? I can barely remember! The last row is a whopper of a row though, and will take quite a bit of time! I have to make all of the wool rolls which includes dying some wool to match what I have. Then there is the dreaded 'rat tail', the tapering off at the end. I just hope that goes well, and I hope that it will all lie flat! This is always a big worry because it is impossible to see all of this the way it is folded up. I guess I will know soon enough! only two and finish! wow, the rug look so great..
How is your Christmas cat doing? Brrrrrr, sounds so cold there. Poor little trees! Perfect weather for stitching, especially with wool in your lap. I love seeing your rug, which is amazing. This rug is an amazing project. You will be very content when you'll have finished it. Drawing at Blacksheep's Bit of the Web! Part One of The Old Aviary is Finished! Anyone live in Illinois? Watch out for your cats!